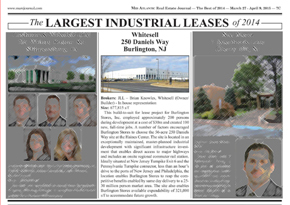 The Mid Atlantic Real Estate Journal recognized Whitesell’s Burlington Stores, Inc. build to suit project at 250 Daniels Way in Burlington, NJ in its “Best of 2014” issue published March 27, 2015, as one of the “Largest Industrial Leases” of 2014. 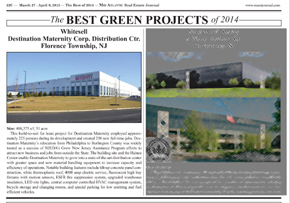 Additionally, Whitesell’s Destination Maternity Corporation Distribution Center project at 1000 John Galt Way in Florence Township, NJ was recognized as one of the “Best Green Projects” of 2014. 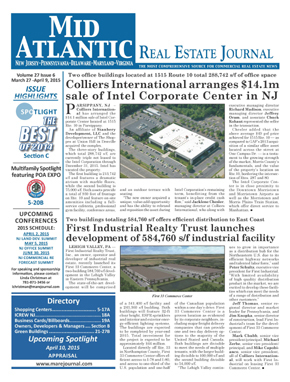 The Mid Atlantic Real Estate Journal’s “Best of 2014” spotlight is a juried competition of submissions and nominations from the publication’s readership. To qualify, projects or firms must be located in the Mid-Atlantic region, specifically New Jersey, Pennsylvania, Delaware, Virginia, Maryland, and DC. The 677,815 square foot build-to-suit project for Burlington Stores, Inc. enable the company to grow into a state-of-the-art distribution center with greater space and new material handling equipment to increase its capacity and efficiency of operations. Notable features at 250 Daniels Way include tilt-up concrete panel construction, white thermoplastic roof, 4000 amp electric service, fluorescent high-bay lighting fixtures with motion sensors, ESFR fire suppression system, high-efficiency HVAC equipment, secured truck court area with guard house, and available expandability of 321,000 square feet to accommodate Burlington Stores future growth. The 406,375 square foot build-to-suit LEED Silver compliant project for Destination Maternity includes tilt-up concrete panel construction, white thermoplastic roof, 4000 amp electric service, fluorescent high bay lighting fixtures with motion sensors, ESFR fire suppression system, upgraded warehouse insulation, LED site lights, a central computer controlled HVAC management system, high-efficiency HVAC equipment, bicycle storage and changing rooms, special parking for low emitting and fuel efficient vehicles, and low-volume water closets. A number of factors encouraged Burlington Stores, Inc. and Destination Maternity Corporation to choose their respective 51 and 56-acre sites at the Haines Center. The buildings are located in an exceptionally maintained, master-planned industrial development with significant infrastructure investment that enables direct access to major highways. Ideally situated at New Jersey Turnpike Exit 6 and the Pennsylvania Turnpike connector, less than an hour’s drive to the ports of New Jersey and Philadelphia, the location enables these firms to reap the competitive benefits enabled by same day delivery to a 25-30 million person market area. Company employees also benefit from a regional commuter rail station located at the park within walking distance of the buildings. 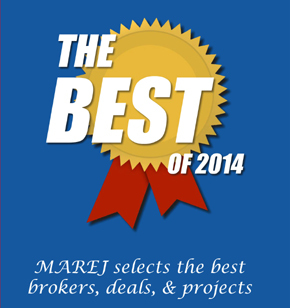 Click the link below to view the Mid Atlantic Real Estate Journal’s “Best of 2014” spotlight.